We are the leading manufacturers of Fasteners Lubricants such as Threading Oil, Tapping Oil, Stainless Steel Nut & Bolt Forming Oils. Threading Oil is a high-performance oil developed for thread forming. This oil has been formulated from high-quality mineral oils having specific package and wetting agents to provide cost-effective machining operations. This oil has been formulated to give non-staining and non-corrosive product suitable for threading operations. Good oxidation & corrosion resistance at elevated temperature. 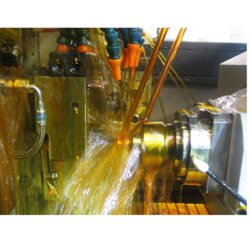 Nut Forming Oil has been formulated with high-quality oils with unique performance package and processing good detergency to ensure cost-effective machining operations. It is developed for metal forming operations of nut & bolt forming. It offers excellent surface finish and longer cutting tool / die life because of EP, antiwear & load bearing capacities. We are involved in offering superior grade Bolt Forming Oil. Offered oil is a high-performance one that is formulated from bolt forming. This oil consists of high-performance extreme pressure and antiwear additives with excellent detergent. Furthermore, it contains high-performance extreme pressure additives and minimizes costs associated with die re polishing.